With a ZyPerUHD, you can easily distribute video up to 4K from any source to an unlimited number of displays directly over a standard Gigabit network switch. Using industry standard CatX cables, you can send audio and video from any HDMI source up to 100 meters away with a clear picture. 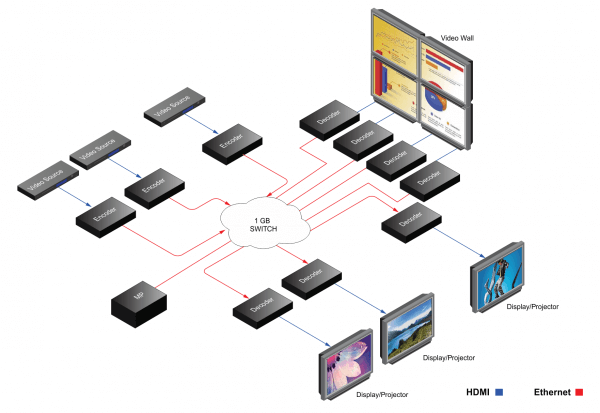 Each source with a ZyPerUHD can send HDCP copy protected HDMI signals to one or multiple displays without any loss of frames. 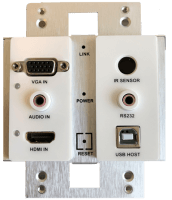 ZyPerUHD uses compression and can distribute video, digital audio, and control signals all over standard networking cables and network switches – eliminating the need for a traditional dedicated AV matrix switcher. Send compressed video up to 4K, audio, and control over Ethernet – ZyPerUHD delivers stunning pixel for pixel reproduction of compressed 720p and 1080p HD resolution content directly over a standard 1Gb ethernet network. ZyPerUHD eliminates the need to have a separate AV network or equipment for video and other AV content. Create and manage video walls up to 25 screens – ZyPerUHD can be used on multiple screens to create a video wall up to 25 screens in a 5×5 configuration. The unit automatically scales and adjusts HD source content to create a compelling wall without any extra hardware or software. You can even mix scaled images with stand-alone screens.